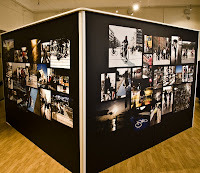 The 'Dreams on Wheels - Danish Cycling Culture for Urban Sustainability' exhibition rolls on. And now there is a website for the exhibition, in English. Here you can read about the exhibition, see which cities it'll be coming to and what have you. Next up is Tokyo and a series of other Japanese cities from 15.05.2009-02.06.2009 and Moscow from 20.05.2009-15.06.2009. I'll thrilled to report that I'll be speaking at conferences in both Moscow and Japan between 21 - 31 May, 2009. 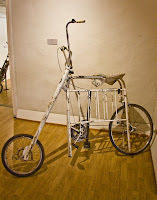 In Danish a nickname for the bicycle is 'garden gate', which is given a new meaning when seeing the one above. There was also a cool old Soviet bike with a crocheted skirtguard. A lovely touch.